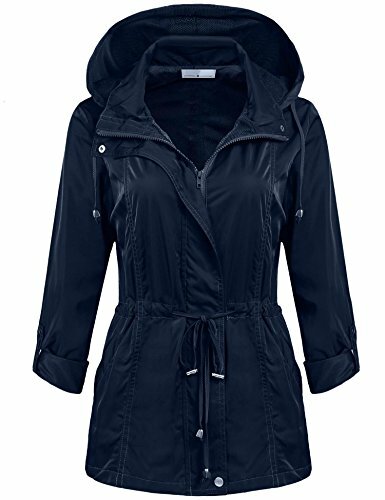 PRECISE SIZE: Please measure your own dimensions before ordering and refer to the waterproof jacket dimension table on the description below. There are 5 sizes (S/M/L/XL/XXL) available for the following listing. Please allow 0.3 inch differences due to manual measurement, thanks. US-S(6): Back Medium Length--28.93" Shoulder--16.22" Chest--42.12" Waist-- 40.55"
US-M(8-10): Back Medium Length--29.52" Shoulder--16.73" Chest--44.09" Waist-- 42.51"
US-L(12): Back Medium Length--30.11" Shoulder--17.32" Chest--47.08" Waist-- 45.51"
US-XL(16): Back Medium Length--30.70" Shoulder--17.91" Chest--50.07" Waist-- 48.50"
US-XXL(20): Back Medium Length--30.90" Shoulder--18.50" Chest--53.07" Waist-- 51.49"